Dr A P J ABDUL Kalam Profession: President of India How much: Rs 1.14 per minute Before taking on the reins of this country, Dr A P J Kalam played a Leading role in the development of India's missile and nuclear weapons Programmes - so much so - that he's fondly referred to as the 'Missile Man'. 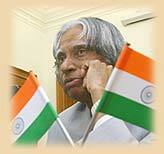 In the early 1990s, he served as scientific adviser to the Government, and his prominent role in India's 1998 nuclear weapons Tests established Kalam as a national hero. For all his work in his Present capacity as President of the world's largest de mocracy, Kalam Draws an annual remuneration of Rs 6,00,000 or Rs 1.14 per minute. Shah Rukh Khan Profession: Actor How much: Rs 247 per minute The King Khan, who started off modestly as a 'Fauji', made about Rs 13 Crore last year. This included his endorsement deals for Pepsi, Hyundai Santro - and of course, wetting himself in a bathtub, Surrounded by women for HLL's Lux. How much per minute? Brij Mohan Lall Munjal Profession: Chief of Hero Group How much: Rs 255 per minute The patriarch of the Hero Group received the Life-time achievement Award for 'Excellence in Corporate Governance' by the Institute of Company Secretary of India this year. Brij Mohan Lall Munjal earned About Rs 13.4 crore last year. He continues to be the world's largest Motorcycle manufacturer and fuels his bank balance with Rs 255 per Minute. Amitabh Bachchan Profession: Actor How much: Rs 361 per minute "Kaun Banega Crorepati? ", Apparently, Mr Bachchan! With more Endorsements and film releases per year than successful actors half His age, Bachchan's take-home last year was around Rs 19 crore - that's Rs 361 per minute. Mukesh Ambani Profession: CMD of Reliance Industries Ltd How much: Rs 413 per minute Head honcho of the $16.5 billion Reliance Industries Limited, Mukesh Ambani was ranked the world's 56th richest man in Forbe's list. But Since this is only about salaries (and the like), we'll completely Ignore his other earnings. Last year, Mr Ambani earned Rs 21.72 crore; A neat growth of 87 per cent over his previous year's earnings. He Makes not less than Rs 413 per minute. Sachin Tendulkar Profession: Cricketer How much: Rs 1,163 per minute India's most loved sportsman makes a lot more than most CEOs of Indian Companies; going by his annual remuneration for 2004-2005. Breaking it Down, his three-year contract for endorsements is worth Rs 180 crores. He is also paid Rs 2,35,000 for a five-day test match and Rs 2,50,000 For one dayers. A little bit of elementary math: This highest paid cricketer in the World makes around Rs 61.15 crore a year, or Rs 1,163 per minute. Indra Nooyi Profession: New Pepsi Chief How much: Rs 2,911 per minute (from October 11) Chennai-born 50-year-old Indra Nooyi was the Chief Financial Officer (CFO) of PepsiCo, the US-based soft drink major. In that capacity, her Remuneration stood at $5 million (over Rs 23 crore). With her Promotion this year, Nooyi becomes one of the highest paid CEOs in the World, with an announced remuneration of $33 million (approximately Rs 153 crores). This means Nooyi makes a whopping Rs 2,911 per minute.